Your accidental death and dismemberment coverage is automatically available to you and activates as soon as you enroll with TruStage® AD&D Insurance. This coverage provides peace of mind to you and your family, offered by TruStage® and underwritten by CMFG Life Insurance Company. 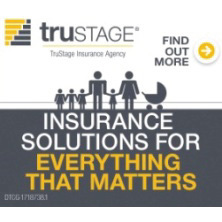 TruStage® AD&D Insurance is made available through TruStage Insurance Agency, LLC and issued by CMFG Life Insurance Company. This insurance is not federally insured or guaranteed or sold by your credit union. Products may not be available in all states. Be sure to understand the complete details of coverage, including any exclusions and limitations. Exclusively for credit union members, we offer TruStage® Life Insurance to help you protect the people who matter most in your life. Underwritten by CMFG Life Insurance Company, these plans are designed to fit your budget and provide excellent coverage. TruStage® Life Insurance is made available through TruStage Insurance Agency, LLC and issued by CMFG Life Insurance Company. This insurance is not federally insured or guaranteed or sold by your credit union. Products may not be available in all states. Be sure to understand the complete details of coverage, including any exclusions and limitations. As a credit union member, you can earn $100 for every line when you switch to Sprint®. Members get a $100 cash reward for every new line when you switch to Sprint®. Current Sprint customers will receive a $50 cash reward for every line transferred into Sprint Credit Union Member Cash Rewards. Allow up to six to eight weeks to see cash rewards directly deposited into your credit union account! We’ve teamed up with Get Away Today to help raise money for hospitalized children. When you book your vacation with Get Away Today, a portion of the package price is donated to our local Children’s Miracle Network hospital. Let them help you plan your next vacation. Visit www.getawaytoday.com or call 855-GET-AWAY for more information. Don’t forget to mention Big Island Federal Credit Union when booking! We sell discounted movie tickets that can be redeemed at any Regal Cinema Theater nationwide. It's perfect for gifts (or yourself)! These tickets are accepted for any movie and have no expiration date. Stop by any of our branches to purchase yours today!